Take a look I’m hosting a giveaway over at ilonaskitchen!! It’s been awhile. I made this before going on a business trip and was going to post while I was gone. But, alas, I did not! 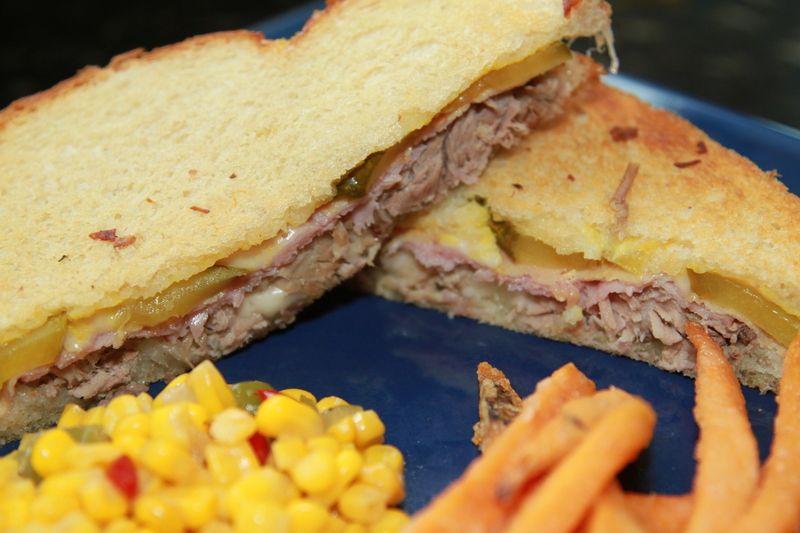 I made very few modifications to this as it is already something the kids will eat as is. I would love it with more spice. I used one can of Cream of Chicken and one can of Cream of Mushroom and added a bag of frozen Southwestern Corn so I could have a one dish meal! I also cooked my chicken with large chunks of onion, bell pepper and carrots in the water so when I drained it those veggies got added to the final casserole. Townie and I both had chicken out this week. I knew she was making Bourbon Chicken, which tends to be pretty sweet so I opted to make a sweet version of chicken as well. I was on Pinterest, my new internet addiction, when I came across a recipe for Brown Sugar Garlic chicken. 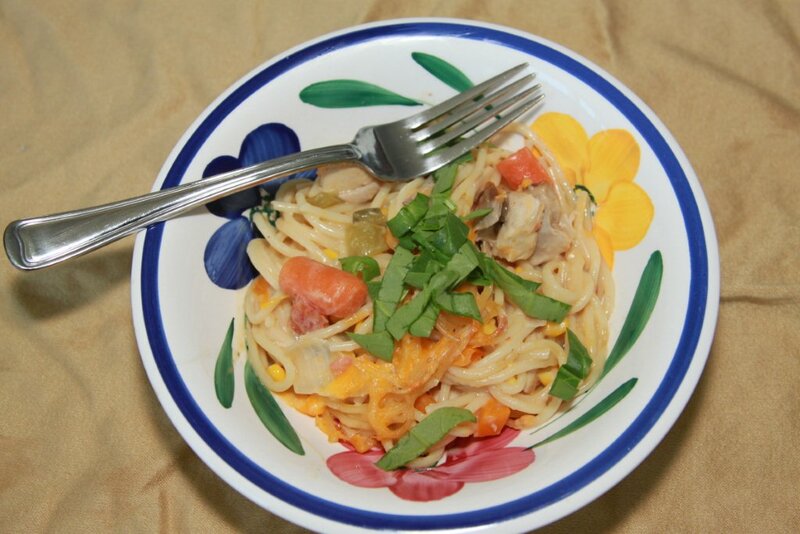 The photo looked yummy and a quick browse at the recipe showed it was super easy because I had all the ingredients and it all gets thrown in a crock pot! I went to “repin” the post to my boards only to discover I hadn’t logged in! So, when I logged into the site I could no longer find the recipe. But, I could “remember” most of what I had read so that is what I did, with my usual modifications. The chicken was definitely sweet, but fall off the bone (had I used bone in cuts) tender. 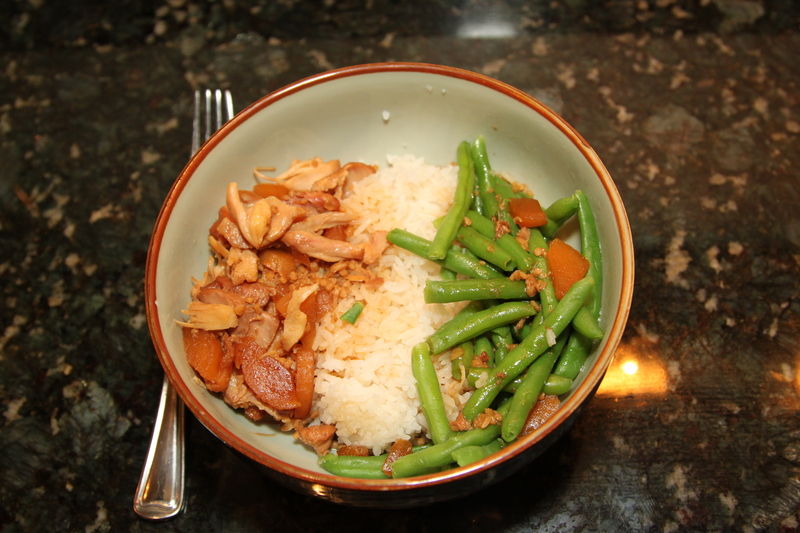 I served it over plain steamed rice with a green veggie as a side, thrown into a bowl to make a one dish meal. The kids LOVED it! I might make it again for an easy meal I know the kidlets will eat without fussing. I suggest hot sauce of some kind, for the grown ups. Literally drop everything into your crock pot, turn it on HIGH and walk away for about 3 hours. Dinner served! Thanksgiving was always a big deal in my family. Even when we lived abroad, we celebrated with a big dinner full of traditions and handed down recipes. Growing up we all had our “part” in our annual family Thanksgiving feast. Mine usually consisted of making place cards, centerpieces and setting the table. Mind you, I have always been a decent cook but, I am about the only “crafty” person in the family thus, tables were my gig. So, this year, at age 36, was the first year I have made the entire Thanksgiving dinner and for the in-laws, no less! Needless to say, I was stressed! I have made a total of 2 – TWO- turkeys in my life before this year. Townie can attest to my first attempt….shoe leather! The second was earlier this year, because I had one in the freezer left over from buying on sale after Easter. I waited 10 years after the leather turkey before attempting it again! 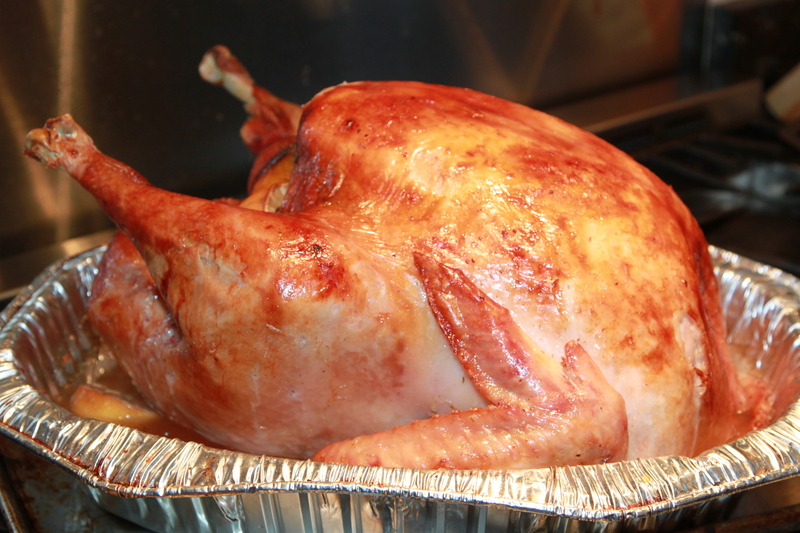 The second time was more successful, it was a mere 12lb turkey so wasn’t too much different than roasting a chicken. However, Thanksgiving with the family requires a much larger undertaking. My 3rd attempt was 23lbs! eeeek!! 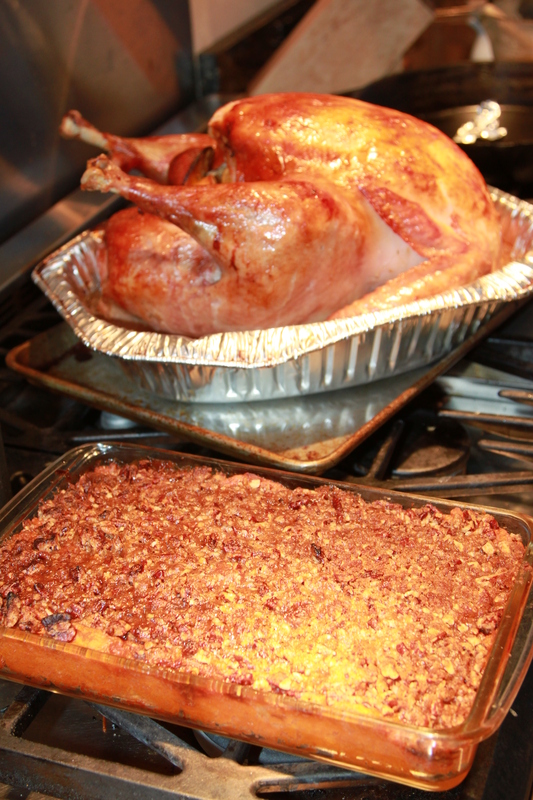 I don’t know how people survive Thanksgiving without (1) ample prep time and (2) two ovens! I actually even contacted my neighbors to see if they were staying home or going to family in case I had an oven-needed emergency! I knew the 23lb beast was going to take up my oven space for the entire day so I did as much prep work as I could prior to sticking Tom in the oven. I made my cranberry sauce and roasted sweet potatoes on Wednesday night. 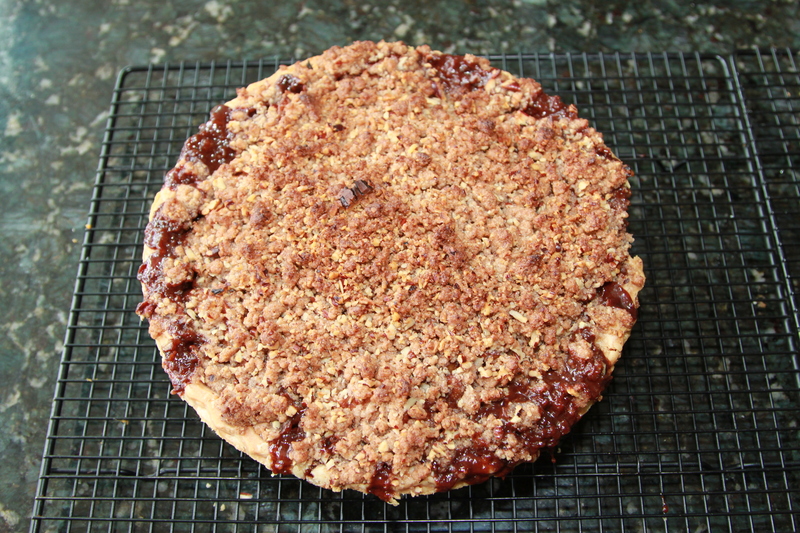 I baked pies first thing in the morning. I have a dual oven, but one side is much smaller than the other so not many of my dishes actually fit in it. But, I have a pyrex that is just the right size so was able to use that for our sweet potato casserole which was able to cook during the last 45 minutes of turkey in the big oven. Stuffing was going to throw me for a loop. I LOVE stuffing, so naturally made way too much. But, the dish I put it in was shallow enough that I could place a rack on the bottom of the oven, and slide it under the turkey rack so, it shared the oven for 1.5 hours. My husband whipped up mashed potatoes for me (he makes them with butter, milk, sour cream and chopped garlic) and my brother-in-law makes the most delicious brussel sprouts on the planet (maybe I can coax the recipe out of him) But, other than that, I did it all myself. 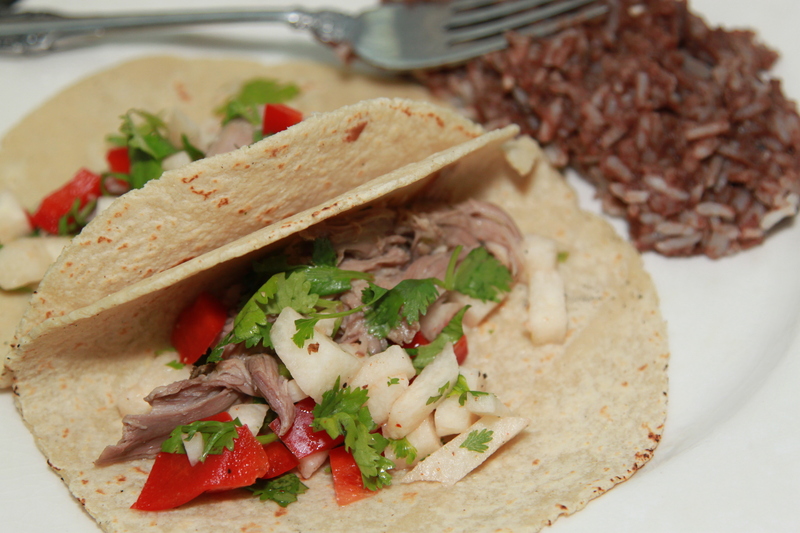 I tried everything a little differently than the recipes I grew up with. I did baste my turkey with a 50-50 mixture of wine and melted butter, just like my dad would. The types of food on the table were the same but, that is about where tradition left. I LOVE the food I grew up with, but this was my opportunity to do everything the way I wanted and you know what, I am thinking new traditions have started. There were a couple of things missing that I feel should have been there, like my great-grandma’s cooked purple cabbage and the oh-so-disgusting but lovable Waldorf Salad, but all in all I was perfectly pleased with our offering (AND, I didn’t have to wash a single dish!!). Turkey – 2 lemons, 2 limes and 2 oranges were cut in half and stuffed into the cavity with 2 full heads of garlic (tops chopped off) and a bunch of green onions. I lathered with butter and rubbed some Citrus Blend poultry seasoning into the skin. Tom was covered with foil and was basted every hour. I removed the foil, except over the breast, for the last hour of roasting (which turned into an additional 45 minutes because those thighs were so thick!) so we could have that beautiful golden color. The turkey was delicious and moist! Sweet potatoes – I have never loved the sticky sweet, canned yams with roasted marshmallows the way my sister does. So, I usually try to make mine with fresh sweet potatoes. I am partial to Red Garnets. So, I used those in my hubby’s aunt’s recipe, which, naturally, I modified! The below recipe is with my modifications. Blend all ingredients, except topping, in a bowl. Bake at 350-degrees for 40-50minutes until golden brown. Stuffing – I modified a recipe from the November/December 2010 edition of Cooks Illustrated Magazine. It was good, but I certainly would have used a little more liquid to make the stuffing more squishy. Heat olive oil in skillet over medium-high heat. Add chicken and cook until golden brown on one side. Flip and repeat. Transfer to a dish and set aside. Add bacon to rendered chicken fat and cook until browned. Transfer to papertowel lined plate, leaving rendered fat in skillet. Heat butter with rendered fat. When foaming subsides, add shallot, green onions and celery. Cook, stirring occasionally, until vegetables are softened but not browned. Add fresh herbs, salt and pepper; cook until fragrant, about 30seconds. Add 1c broth and bring to a simmer, using wooden spoon to scrape browned bits from bottom of pan. Add vegetables to bread mixture, in a large bowl and toss to combine. Grease 9×13 baking dish with butter. In medium bowl, whisk eggs with remaining broth until combined. Add to bread mixture along with berries and apples and bacon pieces. Toss to combine and transfer to baking dish. 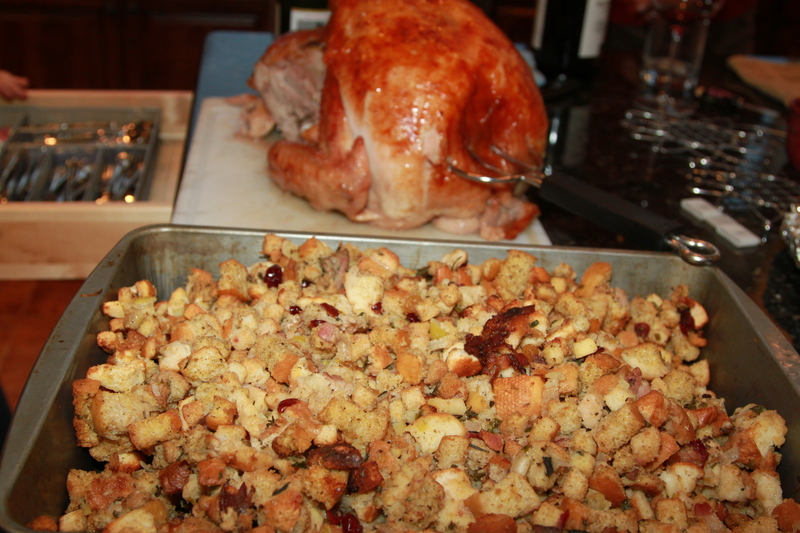 Top the stuffing with the chicken pieces, cover with foil to trap moisture and bake for about 60minutes. 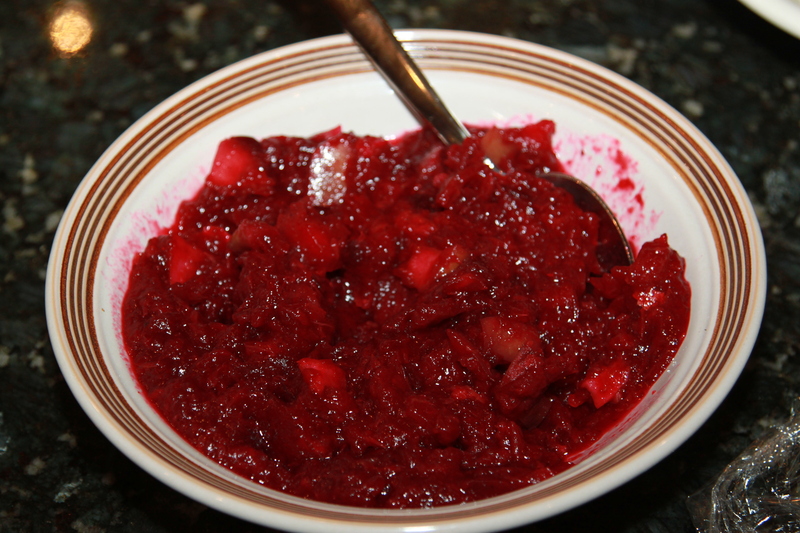 Cranberry sauce – I used this Maple, Citrus & Ginger Cranberry Preserves recipe and it is my new favorite way to eat the tart berry. 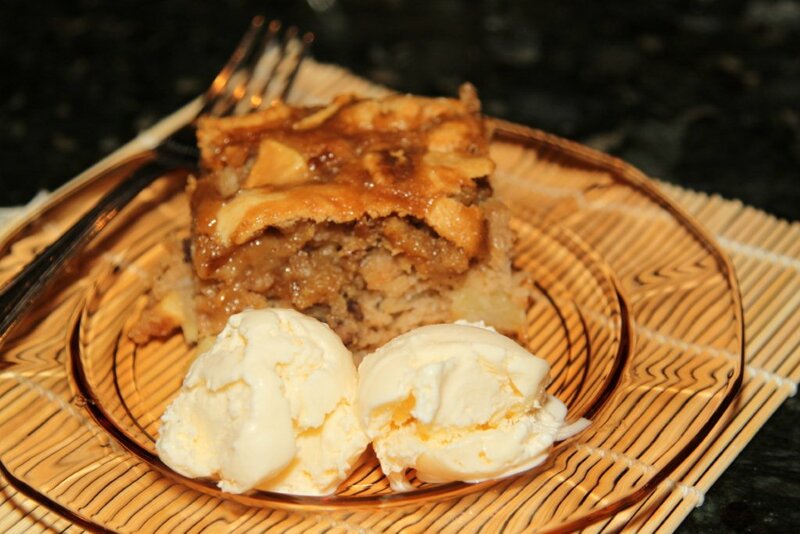 Apple pie – I made Southern Comfort Caramel Apple Pie, which was heavenly sinful, just as “advertised”. 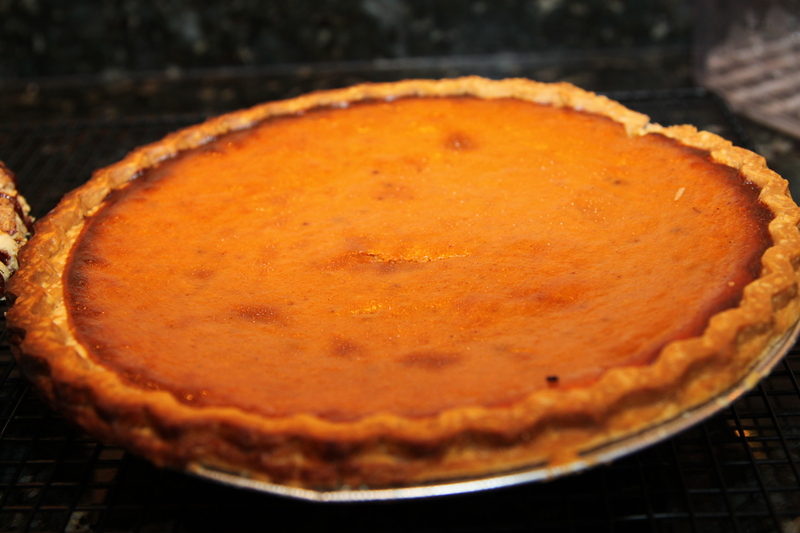 Pumpkin pie – I followed the recipe on the back of the Libby Pumpkin Pie Filling can but grated about (I saw about as I didn’t actually measure) 1/2t of fresh ginger and 1/2t of fresh nutmeg into the custard and boy oh boy did that make a HUGE difference! I also always whip my own whipped cream, heavy whipping cream some pure vanilla extract and a dash of sugar. There is no comparison!! In the end, there is really nothing to worry about. Family isn’t going to judge (well, not seriously, right?!?!?). While we put so much emphasis on the food and we spend all day cooking it for 1 hour of together time, Thanksgiving is more about being thankful for what we have. We were discussing, during our meal, how fortunate we are to have all this delicious food on our table, a comfortable roof over our head and an abundance of logs in our fireplace to keep us warm. In a day and age when so many have nothing, I am ever more grateful for all with which I have been blessed. That hour at the dinner table, laughing and telling stories is what will stick with everyone far longer than the memory that Bumpkin’s 3rd attempt at a turkey took an hour longer than anticipated…then again, that could have been an extra hour of wine talking! This week we decided to just wing it with the recipes. I asked Townie if she had a pork roast in the freezer, as I had one thawing. Rather than cook the same recipe we decided to both make something with our pork roasts and post. 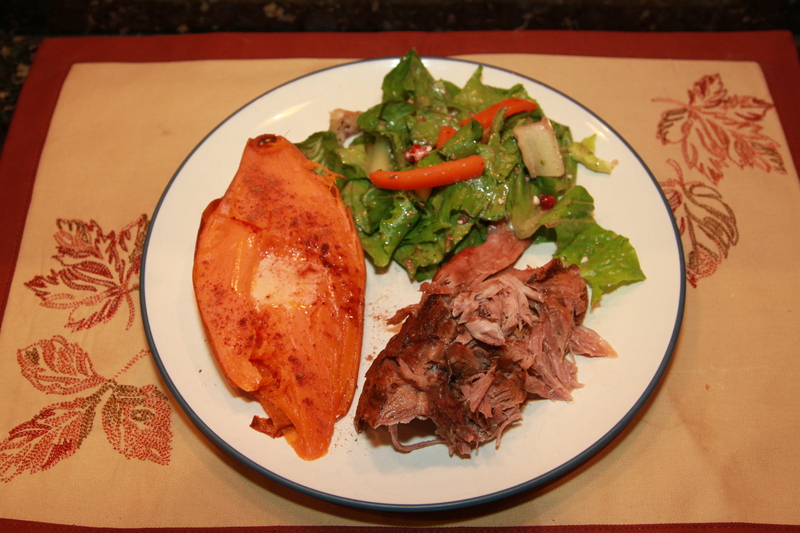 She opted for the delicious (we are having it tonight) Asian Pork – seen in her post below – and I went with some of my old standbys. Namely – a crock pot, chicken broth and my dad’s super secret dry rub, which contains brown sugar and chipotle, for sweet and smoky flavors, in addition to about a gazillion other yummy spices. I usually also throw in a ton of chopped garlic but didn’t this time because I was going “simple”, as I was doing this right before walking out the door for work.. I rubbed up the pork roast, threw it in my pot with some broth, put the lid on and went to work. When I returned home, my hubby had baked some garnet yams in their skins, which we served with a pat of butter and pumpkin pie spice. I threw together a mixed green salad with multi-colored bellpeppers, pomegranate seeds and feta tossed in olive oil and pomegranate red wine vinegar. Voila, dinner was served. There is absolutely NO reason to not have a beautiful dinner on a work night. We have a monthly dinner with friends and this month was our turn to host. With some simple ingredients on standby, there is no reason not to “entertain” just because you work all day. I usually would have planned a dessert but got home late from work the night before and I knew Krista wouldn’t mind coming to my rescue….this time! She brought over some spice cupcakes with fresh peach filling and delicious cream cheese frosting. Does this meal not SCREAM fall to you!?!?! 1. Literally chuck it all in a crock pot, cover and cook on high for 8 hours. 2. ENJOY fall off the bone deliciousness!